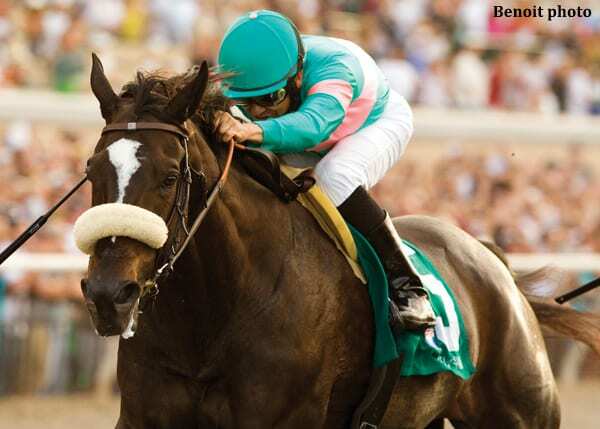 Champion Zenyatta has been confirmed in foal to Into Mischief for the 2018 breeding season. The Daily Racing Form reports that the 13-year-old mare, who delivered a Medaglia d'Oro filly May 9, was covered on June 3. “Dottie [Ingordo, racing manager for owners Jerry and Ann Moss] picked the horse, and it seems like he's become pretty important along the way,” Jerry Moss told the DRF. Into Mischief is by Harlan's Holiday. He stands at Spendthrift Farm for a fee of $75,000. He is a half-brother to champion Beholder. During his racing career, Into Mischief captured three of six starts and earned $597,080. His biggest win came in the G1 CashCall Futurity. Into Mischief's runners are led by Canadian champions Miss Mischief and Conquest Enforcer; Goldencents, two-time winner of the G1 Breeders' Cup Dirt Mile; G1 winner Practical Joke; G2 winners Vyjack and Vicar's in Trouble; and G3 winners Can the Man and One Liner. This entry was posted in Bloodstock, NL List and tagged beholder, Horse Racing, into mischief, spendthrift farm, thoroughbred, zenyatta by Paulick Report Staff. Bookmark the permalink.